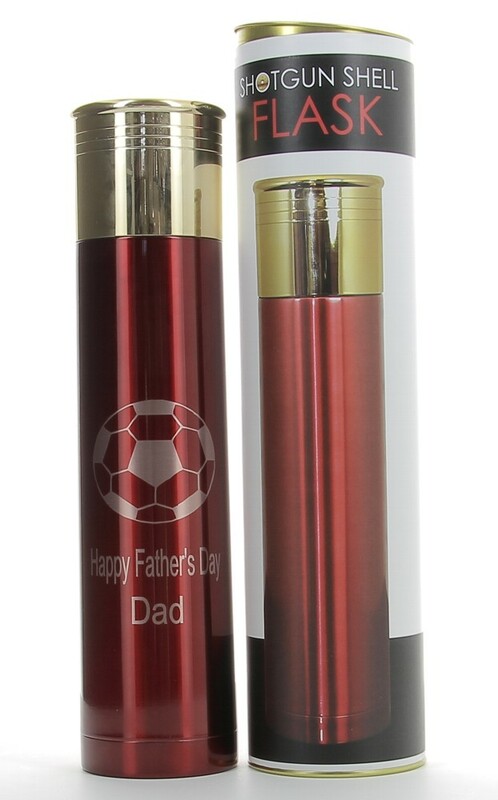 Personalised Engraved Stainless Steel Shotgun Shell Flask. This double wall vacuum flask in the shape of a shotgun shell will retain hot or cold temperatures and comes with easy to use click and pour stopper. Will keep hot drinks hot for up to 8 hours and comes packed in a presentation tube. This amazing hip flask measures 335mm x 80mm and it holds 1000ml (1.75pts)!! Beautifully finished red flask with a gold lid. All you need to do it let us know the text you would like laser engraving on the flask. You can choose to have your text engraved with the flask vertical or horizontal. When engraved it shows as silver. You can have a standard in-house image (please specify) or you can upload your own logo (it MUST be black and white only and have no greyscale). These are perfect gifts for lovers of shooting, hunting and fishing.